Eligible participants are design students, graphic designers or creatives generally that produce work within the context of graphic and visual communication. Applicants must be over 18 years of age. The work submitted for all categories can be either published between the 1st of Jan 2016 and the 31st of Dec 2018, or unpublished. Participants are responsible for any copyrights and other legal issues concerning their work submitted. Each participant can submit maximum five posters in total, distributed in any of the six thematic areas of the Triennial call (e.g. all five in category A or 2 in category A, 2 in category B and 1 in category C etc.). In case of exceeding the maximum number of five entries, the Cyprus Poster Triennial (CPT) preselection committee will consider the first five for review. Series of posters are not considered as one entry, but as multiple entries. Submission of posters to the Cyprus Poster Triennial (CPT) is free of charge regardless of the number of entries. For all Published work, the smallest poster side may not be less than 35cm. For all Unpublished work the size of the Poster must be in portrait format, 50cm x 70cm. The Cyprus Poster Triennial (CPT) has the right to exhibit and publish the work submitted for non-commercial purposes. 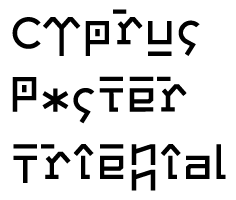 The Cyprus Poster Triennial (CPT) will announce the names, surnames and countries of the selected participants on their official website and social media platforms. All submitted work will remain in the Cyprus Poster Triennial (CPT) and will not be returned to the participants. All participants who submitted their work to the Cyprus Poster Triennial (CPT), thereby agree with the current terms of participation. All participants must provide a valid email address. Multiple submissions must be followed by one email address only. Please make sure you submit the correct format and resolution in order to avoid any technical troubles with the submitting system. Fill all required information in English. Please make sure you upload your files with the dimensions described in 1.3, in RGB, JPG format (compression 8) and 150 dpi resolution. Each poster should not exceed the size of 2MB. if more than one in the same category then B_2_MARY_ANDREOU_CYPRUS.JPG etc. The posters submitted will be firstly reviewed by a pre-selection committee, whilst a selection jury consisting of distinguished designers, illustrators and curators, designated by the Cyprus Poster Triennial (CPT) will evaluate and select the final participants. The official notification concerning the selection of posters, will take place in March, 2019. The selected participants and posters will also be announced on the Cyprus Poster Triennial (CPT) official website. Please note that any creators who wish to print their 50X70 poster(s) digitally in Cyprus, may do so at one of our printing supporters ‘The Copy Shop’ by contacting directly Mr. Yiotis Kyriakou at thecopyshop@cytanet.com.cy , telephone 00357 25353572 at the price of 8 euros including VAT per 50X70 poster. The selected poster(s) should be accompanied by the Entry Form(s) provided during the submission process. The relevant Form(s), must be printed, filled in English and attached at the back of each poster (bottom right corner). Please, refrain from using glue or other ways that might damage the poster(s). In order to preserve the selected poster(s) during the process of shipment, please consider the use of postal tubes. Kindly note that damaged and/or folded posters, will not be accepted. In case the poster(s) arrive damaged, the designer(s) or studio(s) will be immediately notified in order to arrange a resubmission of the work. Please, ship the selected poster(s) via Public Mail services and/or using EMS Datapost. The Cyprus Poster Triennial (CPT) cannot accept or pay additional costs and taxes, resulting from the shipment via private companies. Kindly note that the shipment must be made under the NO COMMERCIAL VALUE (NCV) declaration, bearing the relevant sign. The organizers are authorized to reproduce the submitted posters, in relevant catalogues, electronic and promotional media, as well as promotional events related to the Cyprus Poster Triennial, for non-commercial purposes, while the creators’ credit is being appropriately given. Participants are responsible for any copyrights and other legal issues concerning their work submitted. All of the posters will become part of the acquis of the Cyprus Poster Triennial (CPT), upon their initial submission. The organizers reserve the right to refuse the participation of posters that are considered to be morally and culturally offensive, or otherwise contain abusive content.